US Made, circa, 1920's-1930's. 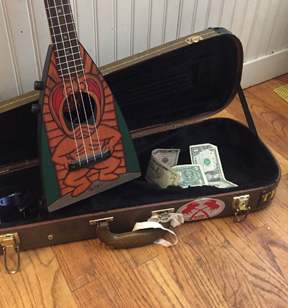 Has soundhole lable with an illustration of an 15th centruy sailing ship, and the words, "AW Ukuleles, Stowe, VT". Back of Peghead is also stamped "AW Stowe, VT" inside an oval. It is unclear if AW was the Manufacturer, or a distributor. I have seen two examples of the AW, one with Violin type wooden friction tuners, and one with Patent pegs.